My childhood would not have been the same without learning to do the Moonwalk in front of the TV to a Michael Jackson video. I was completely mesmerized by him. I remember sitting in front of the TV, silent, mouth open, watching him dance, listening to him sing, and watching his concerts with all of the screaming, fainting fans. I was silent, that is, if I wasn’t up dancing along with him. I would roll up on my tip toes, bite my bottom lip, scrunch my nose, grab my crotch and throw my hand in the air (and I'm sure I probably threw in a little "Aaow!"). I begged my parent's to let me go to see him in concert when the Bad tour came to Pittsburgh, but I wasn't allowed to go (OK, granted I was only 8, and I can understand their decision now). I wanted to be one of the girls in his music videos so he would sing to me, like in The Way You Make Me Feel. I tried to convince my mom to let me buy a red leather jacket with zippers and buckles that I saw in a department store, but she said that it was too expensive, and that I would never wear it (she was wrong here... I probably would have worn it every day). And, I cried for days when I dropped my Sony walkman into Cheat Lake… not because I lost the walkman, but because my MJ mixed tape was in it! He’s still down there somewhere singing at the bottom of that lake. I had an MJ record that I would play over and over on my mini record player, dancing and singing by myself for hours. He even taught me geography, as I remember wondering why MJ liked a Librarian Girl so much (then I learned that LibERian was a nationality). 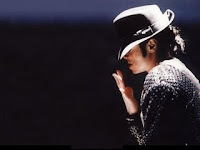 So many of my memories of childhood are linked to Michael Jackson, that I think that’s one of the saddest things to me. It feels as if a piece of my childhood died along with him on June 25th. A lot has been said about his eccentricities that past 10-15 years, and how his lack of a proper childhood really affected him. Even as he changed over the years, I still followed him, watched his interviews, awaited his new music videos, and weathered the storm of the tabloids. I heard the news, but I also know that they would take the smallest thing and blow it out of proportion, or even flat out make stuff up. I just always thought to myself, “yeah, but he’s still Michael,” and I still feel that he was genuinely a good person, with a good heart trying to “heal the world.” But, I do prefer to remember the MJ of the 80's & early 90’s, during his peak. That is what I picture in my head when I hear his songs. There was an article on MTV news entitled "A World Without Michael Jackson Has A Lot Less Magic In It." The title pretty much sums it up. I agree/identify with almost everything in this article, such as "for the first time in nearly four decades, there will be kids who grow up without ever knowing what it's like to have Michael Jackson in their lives. Jackson's death has left a gaping, generation-sized hole in the entertainment world, one that a hundred Justins or Britneys or Jiggas or Kanyes will never fill. That's the reality of the situation. We've witnessed the end of something here; something we probably won't be able to comprehend anytime soon." This does actually make me sad, that my children won't be able to see him in action. Then again, neither did I. That was my lifelong dream, and I was only a couple months away from fulfilling it, along with over a million other people that had tickets to his 50 sold out shows for the This Is It tour in London. I'm sure it would have been an awesome show. I hear they even have videos of the rehearsals that they might release as a movie, and a tribute show planned, and so on and so on, so we'll probably see glimpses of it.